Wedge Worldwide: Free Books For Blog Readers! 3-25-08 Please Note: Thanks to all our blog readers for your interest, but the promo has now ended. We will be offering a free copy of the book Prescription for Nutritional Healing to the next six blog readers who place an order through Wedge Worldwide! When you are in the checkout pages simply enter the code: blogpromo in the comments box and we will ship this handy reference guide with your order! With more than five million copies sold, Prescription for Nutritional Healing is the nation's number one-bestselling guide to holistic health. It normally retails for $23.95. Our employees at the Wedge use it all the time! For ten years and more, people interested in alternative healing and preventive therapies have relied on this invaluable reference as a guide to improve health through nutrition and supplementation, avoiding traditional drug therapies. Part One lists and explains the various types of nutrients, food supplements, and herbs found in health food and drug stores. Part Two describes more than 250 common disorders, from acne to yeast infection, arranged conveniently in alphabetical order, and identifies the supplements that can be used to combat the conditions. Part Three is a guide to alternative remedies and therapies that can be used in conjunction with a nutritional program. In addition, self-diagnostic tests throughout the book offer in-depth coverage of a wide variety of topics. 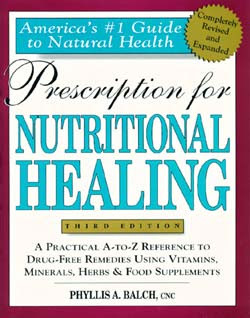 Thanks for shopping with Wedge Worldwide and enjoy staying healthy with the aid of this great book!